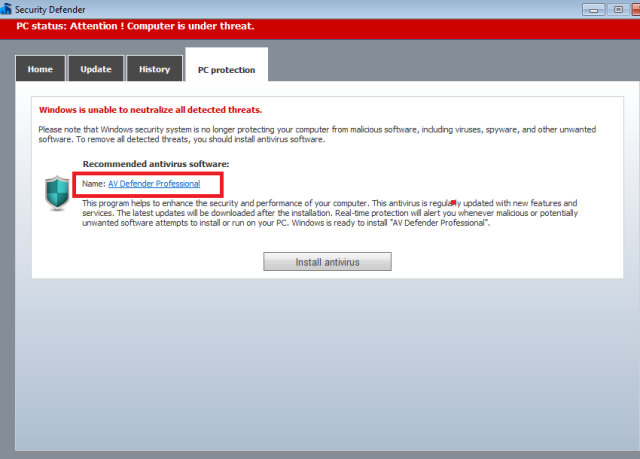 AV Defender Professional is an invasive type of software program that is not acceptable and every user want to remove it from the computer. This malware has targeted thousands of computer users worldwide and spread at an increasing rate. It gets installed on the machines without user’s full knowledge using the Internet as a medium to spread itself. To get the access on target computer, it exploits the software exploits and vulnerabilities in the Internet applications. It uses social media sites and apps to leave malicious links and spam emails onto users’ computer. If it is installed and running on your computer, it may try to take the control of certain Windows functions. It resists the changes and actions if users try to remove its code and uninstall it. It can give users too much pain because it does not allow the Internet access if you try to access any security site in orders to download its removal tool. AV Defender Professional effect tends to display fake warnings and pop-up alerts that sends fake alerts and messages that various types of infections are detected on your computer. It runs like any other installed software on your system, but normal uninstall procedure may not be enough for it because malware and adware does not allow user to easily delete its file in typical manner. You need sufficient tools installed on your computer to find and delete hidden malicious entities. This fake security program sends these messages to deceive computer users and compel them to make a payment for registration code of the AV Defender Professional. So do not trust it because it is developed to steal money from you using multiple methods of deception. Rather remove this worthless and irksome application from your computer instantly. You need to upgrade it to full version for easy uninstall. You need to do this at this stage otherwise; it may be difficult to perform removal procedure. To activate it, click on register or activate button on the console and enter the serial number it shows. When it asks you to enter you email address, input anything you want. Download and install the application first. make sure that you are downloading and installing the appropriate version for your Windows System. When it asks to save the file, choose a convenient location. Once the download is complete, Windows will prompt that it is completed. Now, you need to click on Run button to start the program. Or you can browse the location of the folder and double click on the file defencebyteAVPro_.exe. Then accept the company terms to continue and now you are ready to go. 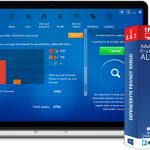 Perform the scan on your computer to find AV Defender Professional and other malicious entities. Further, follow the prompt to continue with the removal.